Strang’s prospects seemed very bright and then, without warning, he lost both his parents to illness when only a teenager. Strang took a job making typewriters for H.H. Franklin Manufacturing Company. When they moved into the automobile business in 1902, 18-year-old Lewis became a chauffeur for founder Herbert Franklin. Strang continued as a chauffeur and hooked up with the “Sugar King,” Henry Osborne Havemeyer, who earned a fortune with the American Sugar Refining Company. Havemeyer was a Mercedes man, and it was here that Strang met the German driver Emil Stricker, who mentored him in the art of road racing. This work earned him the opportunity to demonstrate cars from 1903 through 1905. One client was Joseph Heller, an importer of Belgium’s Pipe automobile brand. With Heller he was given his first opportunity to race automobiles in a mile straightaway at a race in Long Branch, N.J. in 1905. Strang’s first taste of big-time auto racing was as a riding mechanician to his uncle Walter Christie (Source: Enclcopedia of Auto Racing Greats, Robert Cutter, Bob Fendell 1973) in the 1906 Vanderbilt Cup Race. His uncle played a pivotal role in his career in 1907. They traveled to France as the only American entry in the July 2nd French Grand Prix. A rash of mechanical problems forced them to the sidelines to finish last among 38 cars. After they returned to America, Uncle Walter broke his wrist in an accident at Brunots Island, Pennsylvania on September 9. Strang drove the Christie Grand Prix car and gained notice by setting a new track record of 67.16 miles per hour on October 16 at the Birmingham, Alabama state fairgrounds dirt mile. This feat set Strang up for a spectacular year in 1908. 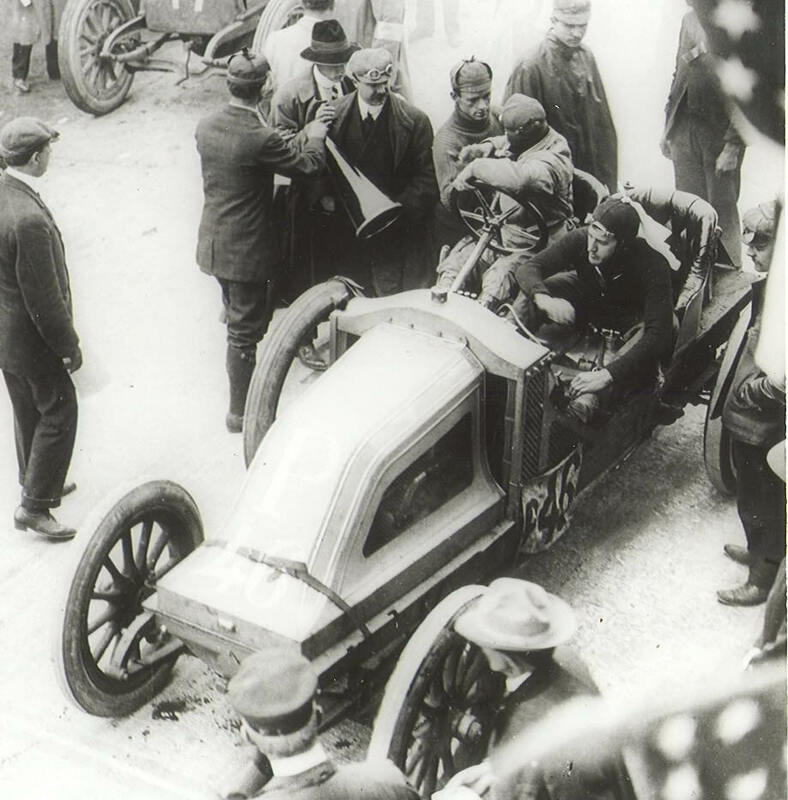 Driving friend John Tyson’s Isotta, Lewis Strang dominated the major road races of Savannah, Georgia; Briarcilff, New York and Lowell, Massachusetts. All of these events were billed as stock car contests. Each manufacturer had to provide evidence that they had produced at least five of these vehicles to qualify. On March 19 Strang proved unbeatable on Savannah’s 17.1 mile course of winding red clay. He led 19 of 20 laps, only giving way to Lozier driver Harry Michener when he stopped for service on lap eight.While only eight cars entered the Savannah race, the April 24 contest in Briarcliff, attracted 22 entries. Among them were some of the biggest names in the business: Barney Oldfield, Ralph DePalma and George Robertson. Briarcliff delivered a treacherous 30-mile circuit that made the early courses of the Vanderbilt Cup Races look like a refined super-speedway. Much of its distance was not roads at all, but paths winding around ponds and over completely undeveloped terrain. None of this deterred Lewis Strang. He was unstoppable, leading the entire 240-mile distance before an estimated 100,000 spectators. Strang was now hailed as America’s new driving star. Not surprisingly, the E.R. Thomas Company called on his sense of patriotism to tackle the July 7 French Grand Prix. While Strang’s driving talent was unassailable, the Thomas car simply didn’t stack up to the European competition. The car’s clutch blew out on only the fourth lap, placing Strang well down in the field. As with Savannah, the September 7, 1908 Lowell race presented a small entry list, this time with only seven cars. Still, there were several premier drivers, including future Vanderbilt Cup winners George Robertson and Harry Grant. Strang, with riding mechanician Leo Anderson, stormed to the front. Setting fast time for eight of the race’s 10 laps, Strang led from start to finish with Harry Grant in the French Berliet 28 minutes behind in second. Paul LaCroix, the owner of a Renault racing team coveted the driving services of Lewis Strang. He offered the young driver his Renault Grand Prix racer for the Vanderbilt Cup Race making Strang one of the favorites to win America’s first classic race. LaCroix also provided a stock Renault for Strang in the Long Island Motor Parkway Sweepstakes, the opening event on America’s first modern highway. Strang’s decision to join LaCroix opened the door for Herb Lytle to take the wheel of the Isotta Lewis had abandoned. Lytle had driven an Apperson to second place at Savannah. Strang drove a good race in the Parkway Sweepstakes to finish second with his gray and white Renault, but the Isotta proved to be the car to beat once again. Herb Lytle set a new American long distance race record average of 64.25 miles per hour to take the victory. The Isotta driver beat Strang to the line in the 10 lap, 234.5 mile race by 11 minutes and 15 seconds. The October 24, 1908 Vanderbilt Cup Race proved to be an even greater disappointment for Strang. He was delayed at the start with a faulty magneto and even needed a push from referee William K. Vanderbilt,Jr. (on the far left, wearing a cap and googles). After finally getting into the competition, a defective clutch ended his run early at only four laps. A year that had started with tremendous promise was now in a tailspin leading to tragedy. On November 17,1908, only weeks after marrying Miss Spalding, Strang’s racing mentor, Emil Stricker, was killed. Perhaps heightening the impact of the loss was the fact that Strang and Stricker were sharing a car in a 24-hour record attempt on Birmingham, Alabama’s state fairgrounds track. Just before midnight, Strang handed the Renault over to Stricker. As Stricker charged into a turn, two tires exploded, hurtling man and machine into the fence, killing the driver instantly. The new Mrs. Strang was horrified, setting off a series of trying discussions about changing her husband’s career choice. Determined, Strang made good on his commitment to compete in the American Grand Prize in Savannah – only 9 days after the death of his friend. Outclassed by a number of European teams, Strang finished sixth in the Renault, best among American drivers in the field. Despite a weak close to 1908, Strang was very highly regarded as a driver. William Durant, Chairman of General Motors, was eager to build the Buick brand through racing. He called on Strang to join Bob Burman and Louis Chevrolet on their racing team for 1909. All three drivers had reputations for fearless, “all-or-nothing” driving styles. 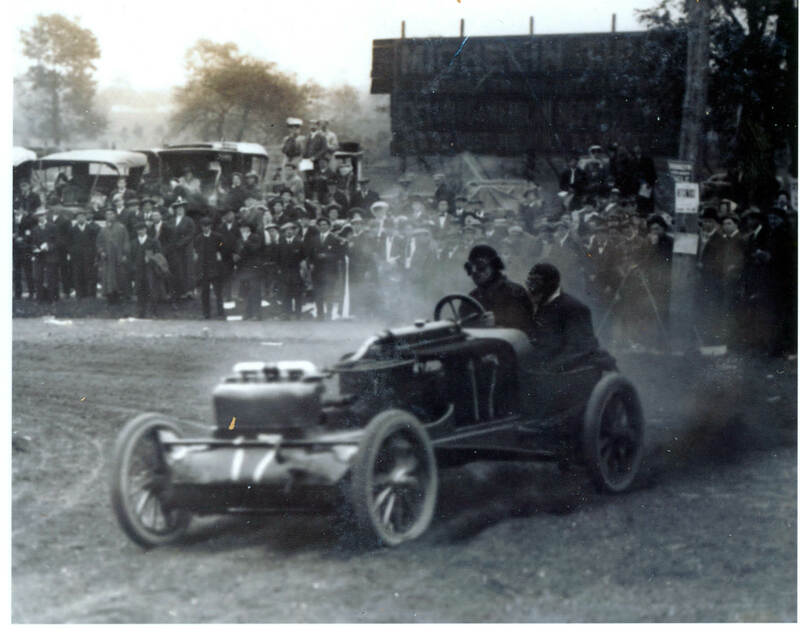 The Buick team toured the country, competing at hill climbs and sprint races or record runs at dirt ovals. Strang scored 19 victories across Tennessee, Illinois, Kentucky, Michigan and Ohio. At Decatur, Illinois, he scored a “grand slam,” winning all three races on the card. At Gurley Track in Waco, Texas he not only won five of nine events, but pulled to a stop to assist a driver hurt in an accident. In August 1909, he helped inaugurate the new Indianapolis Motor Speedway with two wins among the 16 events. He won the headliner 100-mile G&J Tire Trophy, the feature event on August 20. In classic Strang fashion, he led every lap, and set a new world’s speed record for the distance at 64.67 miles per hour. Newspapers carried a romantic, even dramatic photo of Strang and his wife kissing, the bride’s arms thrown around her husband’s shoulders. Not all was well with the Buick team. Disagreements boiled over and Strang resigned. An injury to Ralph De Palma in November provided Strang with the opportunity to slide into the Fiat seat left open by the sidelined driver. Strang promptly scored five victories at a race meet on the 2-mile Atlanta Motordrome oval. 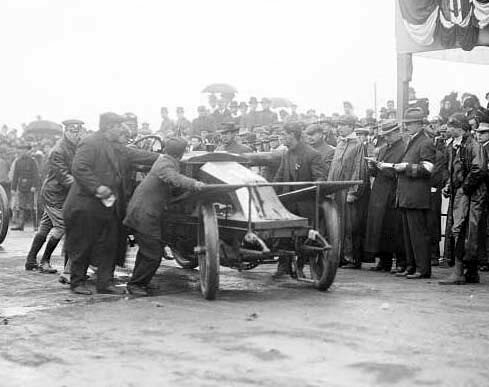 In December 1909, he took the Fiat back to the Indianapolis Motor Speedway to test the freshly brick-paved track. These were the first competitive laps every turned at the “Brickyard.” After several deadly accidents, the Speedway’s management had improved speed and safety of the track by paving the running surface. Strang broke records for the mile, for a lap and for five miles, all set by Barney Oldfield in August. His new 5-mile record of 91.05 miles per hour closed out the meet. In 1910 Strang may have been distracted by marital issues. He did not engage in high-speed contests and focused on ostensibly safer reliability runs. While his wife continued to fret over the danger of automobile competition, Strang reportedly grew uncomfortable with her acting career and its travel demands in the company of other men. Their differences proved irreconcilable. That year, “Louise Alexander” reappeared on stage in a role as a seductive vampire. The marriage was finished. Late in 1910 Strang was approached by the J.I. Case Threshing Machine Company, an agricultural equipment manufacturer, about their interest in entering the automobile business. Strang was asked to lead a racing team to promote their products. It was an opportunity he could not resist. Building a team from the ground up proved to be a very difficult challenge. On March 31, 1911 in a 300-mile race on Atlantic-Pablo Beach in Florida, he was last among four competitors. Up next was the historic first running of the Indianapolis 500. Because he was first to enter a car and starting positions were assigned by date of entry, Strang lined up first on the starting grid for the race. Two other Case entries, one for Joe Jagersberger and another for Will Jones, started the race in eighth and ninth positions respectively. None of the cars finished, falling well short of expectations. From there, things only got worse. He broke his arm crashing through a fence at a race in Kenosha, Wisconsin on June 18, 1911. Despite the injury, he signed up to drive the technical review committee car for the Wisconsin Automobile Association’s annual reliability run from Milwaukee to Chicago in July. Steady rains had soaked the terrain in the vicinity of Blue River, Wisconsin in the days leading up to the reliability run. When confronted with a horse-drawn wagon bogged in mud on the morning of July 24, 1911 Lewis Strang, predictably, attempted a pass. Driving slowly, according to witnesses about 5 miles per hour, Strang steered his Case automobile to the edge of the road near a 5-foot ditch. Suddenly, the soft mud gave way. After barrel-rolling into the ditch, the Case trapped Strang under its weight. The other three men in the car had jumped to safety. Some believed Strang’s mending arm might have impaired his ability to do so as well. Strang died before the car could be pulled off him. The October 24, 1908 Vanderbilt Cup Race proved to be an even greater disappointment for Strang. He was delayed at the start with a faulty magneto and even needed a push from referee William K. Vanderbilt,Jr. (on the far left, wearing a cap and googles). After finally getting into the competition, a defective clutch ended his run early at only four laps. The October 24, 1908 Vanderbilt Cup Race proved to be an even greater disappointment for Strang. He was delayed at the start with a faulty magneto and even needed a push from referee William K. Vanderbilt,Jr. (on the far left, wearing a cap and googles). After finally getting into the competition, a defective clutch ended his run early at only four laps. LaCroix also provided a stock Renault for Strang in the Long Island Motor Parkway Sweepstakes, the opening event on America’s first modern highway. Strang’s decision to join LaCroix opened the door for Herb Lytle to take the wheel of the Isotta Lewis had abandoned. Lytle had driven an Apperson to second place at Savannah. Strang’s first taste of big-time auto racing was as a riding mechanician to his uncle Walter Christie in the 1906 Vanderbilt Cup Race. His uncle played a pivotal role in his career in 1907. They traveled to France as the only American entry in the July 2nd French Grand Prix. A rash of mechanical problems forced them to the sidelines to finish last among 38 cars.